Spring is here…and we’ve put together a guide to the best that nature has to offer this season. Need some extra inspiration to make a trip to your local farmer’s market? We’ve included tips to help you pick the freshest produce and some of our top springtime recipes. One of my favorite things about spring is strawberries. In most places you can buy strawberries year-round. However, starting in March and going through summer, they are at their peak. 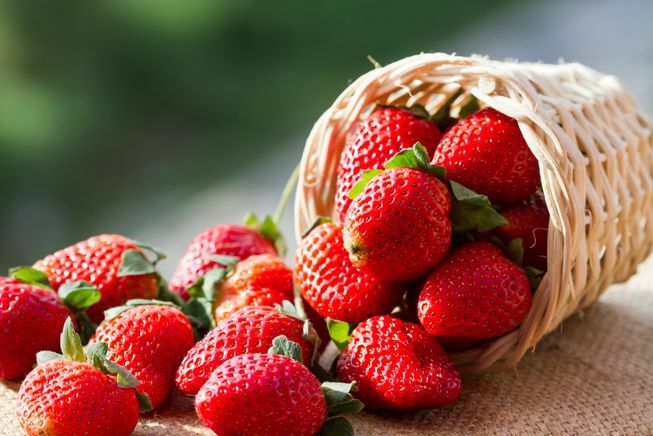 Strawberries are packed with essential vitamins, fiber, potassium and phytonutrients. One serving, about eight strawberries, is an excellent source of vitamin C. In fact, a serving of strawberries provides more vitamin C than an orange! This time of year, I eat strawberries nearly everyday. At breakfast they go in my pancakes, yogurt, or oatmeal. They’re also terrific in salads. And of course there’s nothing like strawberries for dessert. The deep gold color of apricots is a sure sign that they are high in beta carotene, a powerful antioxidant that supports vision, a healthy immune system, and cell growth. Apricots are also a good source of vitamin C, fiber, and potassium. US-grown apricots are at their peak from mid-May through mid-August. Look for fruit that is rich in color and soft to the touch. Try sliced fresh apricots on a sandwich in place of tomatoes. Serve some homemade Apricot Jam on a slice of whole grain toast. Make a super salsa! My favorite Apricot Salsa recipe has just 22 calories per serving! Virtually fat-free and low in sodium, the artichoke is rich in vitamin C, folate, potassium, and especially fiber. The bottom (or what is often referred to as the ‘heart’) of an artichoke has just 26 calories but 3 grams of fiber. While artichokes are harvested year round, their peak season is the spring. To find the best of the crop, look for artichokes that are heavy for their size, with thick, fleshy leaves (scales). I must admit, I am a relatively recent artichoke aficionado. For years I never bought them because I wasn’t quite sure what to do with them. However as long as you have a good knife, they are simple to steam and make a wonderful appetizer or side dish. Here’s a little factoid I bet you didn’t know: asparagus are actually a member of the lily family. They’re also closely related to garlic, onions, and leeks. Interesting trivia aside, these sleek little veggies pack a powerful nutritional punch. Low in fat and high in fiber, they contain iron, vitamin C, and a number of B vitamins, especially folate. Asparagus are available year-round in many places due to imports, however in the US asparagus crops are at their peak in spring. Look for spears that are firm but tender, with dark green or purplish tips. If you’re looking for a quick and tasty side dish, you can’t go wrong with roasted asparagus with just a bit of olive oil. Looking for a burst of beta carotene, fiber, iron, potassium, and b vitamins in just 70 calories per (cooked) cup? Look no further than the carrot bin at your local farmer’s market or grocery store. You can find carrots year-round, but spring is the peak season for most domestic varieties. Choose slim carrots that are firm and bright. (Larger ones may be tough and woody.) If the tops are still attached, make sure they are not wilted. If the tops have been removed, inspect the stem end—darkening is a sign of age. Avoid carrots that have begun to soften or those with cracks. Once considered the ‘poor man’s asparagus’, leeks are getting more of the respect they deserve these days. Like other members of the allium family (such as onions and shallots) leeks contain phytochemicals that may protect against certain types of cancers. Only 32 calories for 1 cup cooked, leeks are a source of fiber and iron. Plus they add rich flavor and a crunchy texture when cooked. Ramps are wild leeks that are abundant in spring. Look for leeks with green, fresh leaf tops. The white root end should have a fringe of rootlets and several inches of unblemished skin. Leeks bring amazing flavor to everything from soups, veggie sides, and even pizza! I always see spinach atop most ‘Superfoods’ lists… and for good reason. Just 1 cup of cooked spinach is an excellent source (meaning it has 20% or more of the %DV) of beta carotene, folate, and iron. Plus it’s a good source of vitamin C. And if you’re calorie-concious, spinach should be your best friend. Two cups of raw spinach has just 13 calories! It’s hard to find more nutritional ‘bang’ for your calorie ‘buck’. I prefer to buy loose spinach (as opposed to pre-bagged) so I can look at the leaves individually. Spinach should be crisp and springy in texture. Discard brown, yellow, or wilted leaves. If you grew up hating spinach, try some of these dishes and you may have a change of heart. And if you already like spinach, you will love these! Sweet cherries are truly one of nature’s springtime jewels. One cup is just about 100 calories, and packed with vitamin C, potassium, fiber, and disease-fighting phytochemicals, particularly anthocyanins, which give cherries their deep red/purplish pigment. Their only shortcoming is their brief peak season (April through June). Sweet cherries are best when they’re large, glossy, firm and deeply pigmented. Avoid fruit that is cut or bruised. Cherries are perfect on their own for snacking, but they are also terrific in sauces, salads, and baked goods. Peas — including green peas, sugar snap peas, and snow peas — are at their peak from April through July. They’re low in fat and high in fiber, and are a good source of plant protein. Their nutritional profile depends on the variety, with green peas providing more B vitamins and zinc, while snow and snap peas offer more vitamin C. No matter what type of peas you use, they’ll add flavor and texture to your meals. Not sure how to pick fresh peas? Green peas should have bright-green pods and fresh, sweet flavor (ask for a taste to be sure). Choose sugar snap peas with firm, crisp pods; small scars are okay. Snow peas should be crisp, bright green and have small seeds.